Cutting horse saddles are highly specialized to meet the unique demands of a high performance sport characterized by powerful horses performing hard, sudden stops; low-in-the-front-end turns; and lightening fast changes of direction. Below are cutting horse saddles from a variety of makers available for sale from HorseSaddleShop and eBay. For a description of cutting horse saddles and cutting horse competition, please scroll down beneath the saddles for sale to see our articles. Below: Cutting horse saddles have high swells and tall, thin saddle horns. Compare prices for cutting saddles for sale from eBay and HorseSaddleShop.com (aka eSaddles). Saddle Swells and Saddle Horn: One of the most noticeable differences in a cutting horse saddle compared to other saddles is their swells (also called the “pommel” or “fork”) and the saddle horn. The swells of a cutting horse saddle are taller than in other saddles, giving the rider more security during the tipped-forward, low-in-the-front-end turns so common in cutting horse competition. The saddle horn is taller and thinner than in other types of saddles, and might be straight or tipped forward slightly. This design allows a rider to grip the horn and push, helping to keep them stable during low, hard turns and sudden stops. Saddle Seat: The seats in cutting horse saddles are designed to be close to the horse, and to create a pocket for a rider to sit deeply and securely during cutting. 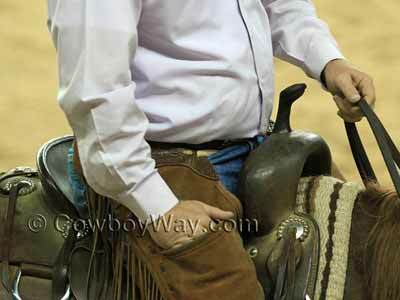 Cantle: The cantle of a cutting horse saddle is lower than in some ranch and other types of saddles. The cantles in cutting horse saddles are designed to allow the rider to sit deep during hard, sudden stops, or low, fast turns. Saddle Stirrup Fenders and Leathers: In a cutting saddle the stirrup fenders are hung farther forward than in many other types of saddles. This allows the rider to push back and sit deep into the saddle during the hard, low, turns, and sudden stops common in cutting. If the stirrup fenders are hung too far back, the rider’s legs will be behind them causing them to fall forward. 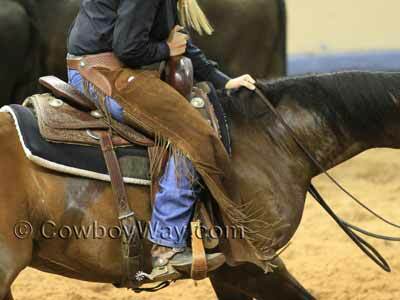 In addition, the stirrup fenders and leathers in a cutting saddle won’t be as heavy as in, say, roping or ranch saddles. Cutting horse riders need close contact with their horses for good, split-second communication. Everything about cutting horse saddles from the swells and horn, the shape of the seat, the style of the cantle, and position of the stirrup fenders are designed to help to keep the rider deeply seated. In this photo you can see the cutting horse getting low in the ground in the front end to make a hard, fast turn. Cutting horse competition is a judged event in which the highest score wins. The objective in cutting horse competition is for a horse and rider to enter a herd of cattle, separate a “cow” from the herd (in this case a “cow” can be a steer, heifer, etc.) and demonstrate their ability to keep the cow from returning to the herd. It is a must in cutting horse competition that the rider does not noticeably assist or cue the horse once the cow has been separated. Cutting horse competition is competed in by both men and women and evolved from the use of horses on a ranch to separate individuals from the herd. 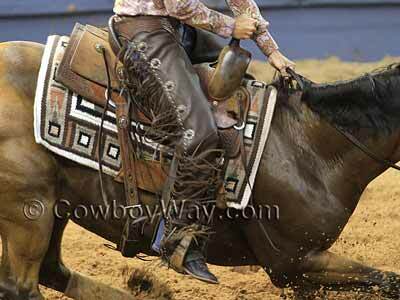 The lowest score a cutting horse can earn is a 60, and the highest score they can earn is an 80. At the start of the competition the cutting horse is assumed to be average and begins the competition with 70 points. After the horse and its rider cross a timeline that starts the competition clock, the horse and rider will have 2 1/2 minutes to perform in front of the judge(s) who will add to or subtract points from the starting score of 70. During the judging process points can be added to a horse’s score for reasons such as excellence in herd work (entering the herd quietly, concentrating on the job to be done, skillfully separating a cow, and more), and demonstrating superior intelligence and athletic ability in holding the cow separate from the herd. Reasons to subtract points include the rider noticeably reining or otherwise cueing the horse once the cow has been separated, and being unable to hold the cow. In cutting horse competition the competing horse and rider are assisted by four mounted helpers. Two of the additional helpers are called turnback riders, and the other two are herd holders. It is the job of the turnback riders to keep the cow from running away from the cutting horse. It is the job of the herd holders to keep the herd of cattle quiet and standing together behind the cutting horse while it cuts. Although it is the job of these additional four riders and their horses to assist the cutting horse, they themselves are not being judged.